Arlecchino, as we know him, is a stock character dating back to seventeenth-century Commedia dell’arte. He also has origins in the atellana farce of Roman antiquity (4th century BCE). In fact, the use of stock characters is a feature of the atellana. Moreover Commedia dell’arte characters could be borrowed from commedia erudita. Molière‘s (1622 – 1673) Miser or L’Avare (1668) was borrowed from Plautus‘ (c. 254 – 184 BCE) Auluraria (The Pot of Gold). However, in European countries, comedy has more immediate origins. It emerged as a brief mirthful form, a mere interlude, during lengthy medieval Passion Plays, Mystery Plays and Miracle Plays. Passion Plays were extremely long, so interludes, comedy, were inserted between the “acts” to keep the audience entertained. These became popular and eventually secularized the religious plays. However, Passion Plays have not disappeared totally. For instance, the Oberammergau Passion Play (Bavaria) has been performed since 1634, keeping alive the birthplace of farces and tom-foolery. It would appear that the commedia dell’arte’s Arlecchino (Harlequin) was also culled out of Passion Plays, where he was a devil: Hellequin, Herla, Erlking and other spellings and names. The origin of the name is attested by 11th-century chronicler Orderic Vitalis (1075 – c. 1142). The name Harlequin was picked up in France by Tristano Martinelli, the first actor to play Harlequin. (See Harlequin, Wikipedia. 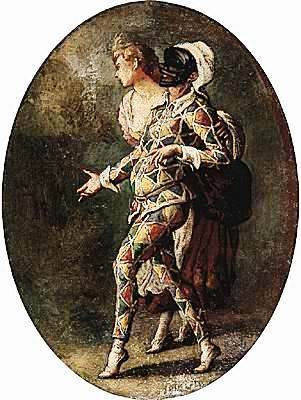 )[i] Tristano played the role of Harlequin from the 1580s until his death in 1630. At this point, Harlequin became a stock character, an archetype, in the Commedia dell’arte. Given that the success of the Commedia dell’arte performances depended on an actor’s skills, we can presume Tristano was a fine comedian. Arlecchino (Arlequin, Harlequin) is a zanno, a servant whose function was called Sannio in the Atellana, Roman farcical comedies. There were many zanni, (Brighella, Pulchinello, Mezzetin, Truffadino, Beltrame, and others). Their role was to help the young lovers of comedy overcome obstacles to their marriage. This plot is consistent with the “all’s well that ends well” of all comedies. We have already met the blocking characters of the commedia dell’arte. Pantalone is the foremost. But his role may be played by Il Dottore, or Il Capitano, or some other figure. Although a zanno has the same function from play to play, as do blocking characters, the alazôn, zanni otherwise differ from one another. For instance, Arlecchino, a zanno, is different than Pierrot. Harlequin is not the growingly sadder clown of Romantic and pantomimic incarnations. He is not Jean-Gaspard Deburau‘s Battiste, nor is he Jean-Louis Barrault‘s Baptiste. He is the clever, nimble, but clownish zanno. Arlecchino is, in fact, the most astute and nimble of zanni or servants. He is an acrobat. This is one of his main attributes. Moreover, he wears a costume of his own, another distinguishing factor. At first, the Harlequin wore a black half mask and a somewhat loose costume on which diamond-shaped coloured patches had been sewn. He would then wear a tight-fitting chequered costume mixing two or several colours. Paul Cézanne‘s (1839–1906) Harlequin is dressed in black and red, but Pablo Picasso changes the colours worn by his numerous Harlequins. In the sixteenth and seventeenth centuries, the Italians were very popular at the French court and so was Harlequin. As of 1570-71, Commedia dell’arte actors were summoned by the King of France to perform in royal residences. In 1577, the Italians were called to Blois by Henri III during an assembly of Parliament. The famous I Gelosi (The Jealous Ones; 1569-1604) “was the first troupe to be patronized by nobility: in 1574 and 1577 they performed for the king of France.” (See I Gelosi, Wikipedia.) 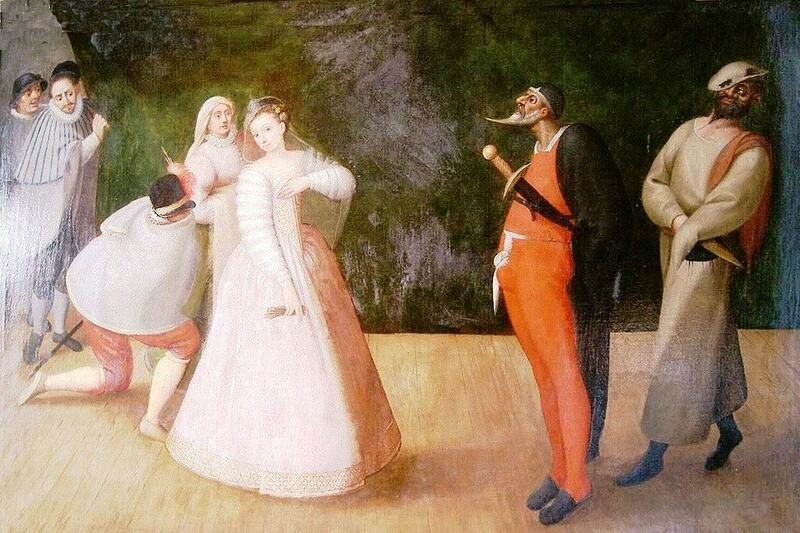 La Commedia dell’arte most famous performers in seventeenth-century France were Isabella and Francesco Andreini. Isabella died in childbirth (1604), but her son’s troupe, the Compagnia dei Fedeli would be invited to perform at Louis XIII’s court. In short, in the seventeenth century, Harlequin was in France. In fact, at one point, les Italiens shared quarters with Molière at the Petit-Bourbon, a theatre. Matters changed in 1697, when the commedia performed a “fausse prude” (false prude) scenario that offended Madame de Maintenon (27 November 1635 – 15 April 1719), Louis XIV‘s second wife. 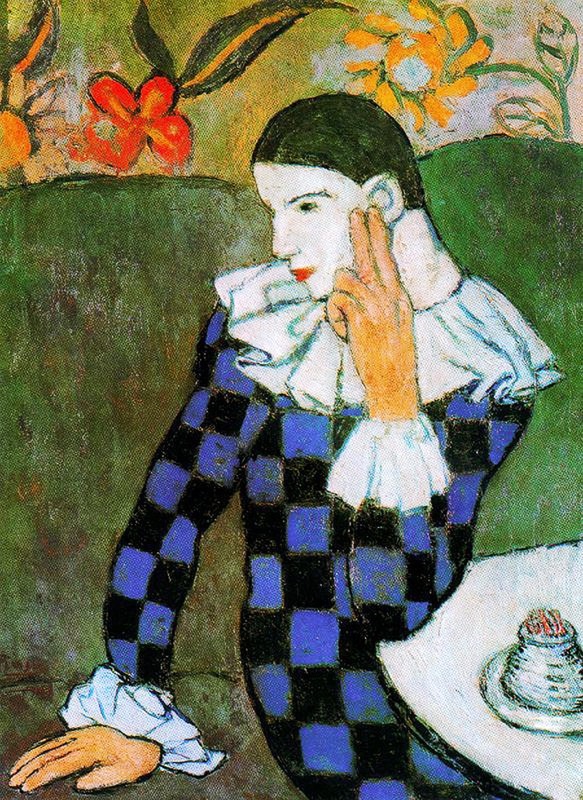 In French seventeenth-century representations, Pierrot loved Columbine who loved Harlequin (Arlecchino). In eighteenth-century Britain, John Rich[ii] (1682 – 26 November 1761, the son of one of the owners of Drury Lane Theatre and the founder of Covent Garden Theatre (Royal Opera House) performed the above-mentioned harlequinades in which “he combined a classical fable with a grotesque story in Commedia dell’arte style involving Harlequin and his beloved Columbine.”[iii] In Britain, harlequinades, became “that part of a pantomime in which the Harlequin and clown play the principal parts.”[iv] Harlequinades also contained a Transformation Scene. [v] Associated with the British Harlequin are pantomime, slapstick comedy and puppetry. Yet, this British Harlequin is rooted in the sixteenth-century Commedia dell’arte. It seems that the best of these English clowns was played by Joseph Grimaldi (18 December 1778 – 31 May 1837). British harlequinades differ from continental versions of Arlequin (FR) or Arlecchino. In other words, in Britain, Harlequin out-clowned Pierrot. As for Pulcinella, although he had appeared, he could not out-clown Harlequin. Furthermore Pulcinella grew into Punch (Punchinella) and, as mentioned above, he migrated to the land of puppetry. But above all, British harlequinades were hilarious: genuine slapstick. Moreover they were pantomimic as would be Jean-Gaspard Debureau‘s (Battiste) as well as Jean-Louis Barrault‘s (Baptiste). Baptiste is nimble and precise, but in England, the chaotic “chase” had begun. The last harlequinade was played in 1939. Sergei Diaghilev‘s enormously successful Ballets Russes were inspired by the commedia dell’arte. Diaghilev commissioned a ballet version of Pulcinella, composed by Igor Stravinsky and choreographed by Russian-born Léonide Massine. 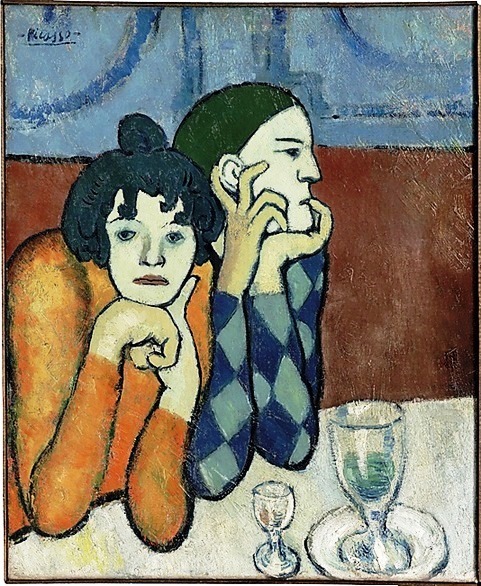 Furthermore, Pablo Picasso, who had already painted characters from the Commedia dell’arte, Harlequin in particular, designed the original costumes and sets for the ballet (1920). Harlequin and other members of the Commedia are associated with Pierre de Marivaux (4 February 1688 – 12 February 1763). Marivaux wrote many plays for the Comédie-Française and the Comédie-Italienne. But we are skipping Marivaux’s polished Arlequin because the discussion would be too long and too complex. 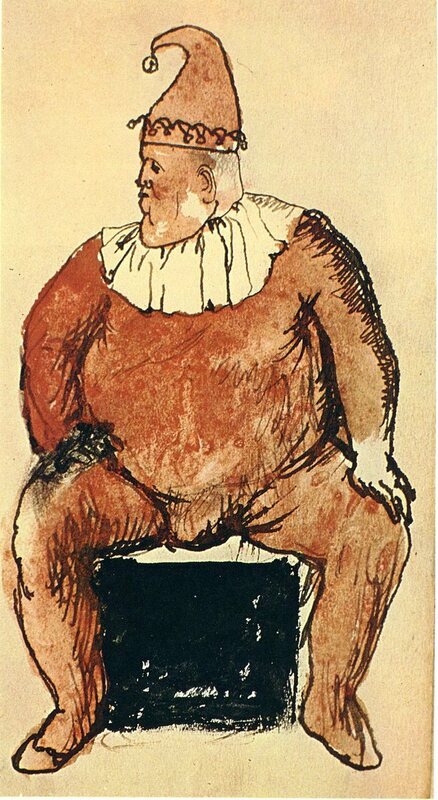 We will instead look at images, Picasso’s in particular, and provide the names of innamorati, lazzi and zanni, but that will be my last post on the Commedia dell’ arte itself. [ii] “John Rich”. Encyclopædia Britannica. Encyclopædia Britannica Online. “Compagnia dei Gelosi”. Encyclopædia Britannica. Encyclopædia Britannica Online. “Harlequin”. Encyclopædia Britannica. Encyclopædia Britannica Online. “Passion play”. Encyclopædia Britannica. Encyclopædia Britannica Online.